In a modern Office 365 workplace, small business teams and lean startups aren’t just using technology: they’re being transformed by it. SaaS-based apps deliver cutting-edge solutions within Office 365 and everywhere you work, enabling you to communicate, collaborate, and make informed decisions with less up-front investment and IT infrastructure than ever before. This is the first blog post in the Nimble Workplace series introduces the power of using Nimble within Office 365, on social media and everywhere you work. Ultimately, our goal is to help you make informed decisions when charting your digital business strategy to help you grow. Is your team missing out on the power of leveraging a simple CRM, as well as important opportunities to engage with prospects and existing customers? Are you still managing your contacts and sales pipelines within disjointed spreadsheets, buried emails, and scattered Word documents? After transitioning to Nimble, teams are able to focus on selling more, quickly connecting with more prospects, and optimizing internal processes. This is because Nimble unifies your team’s Office 365 communications, social media interactions, contact records, and calendar events to give you the tools you need to build better relationships, stay on top of important follow-ups while managing your sales process cycle and pipelines. 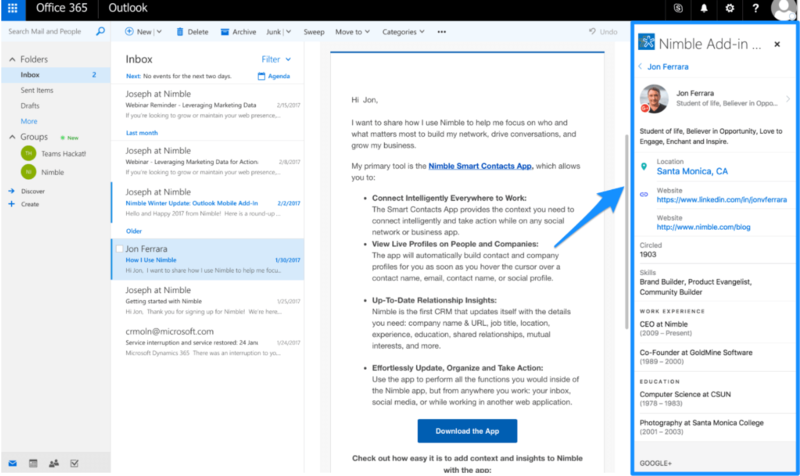 Additionally, the Smart Contacts App for Outlook allows you to easily access the benefits of your Nimble CRM without having to leave your Office 365 inbox. Scaling is critical in sales and business success. With that in mind, how can you develop trusted relationships more quickly, and authentically while boosting customer satisfaction? 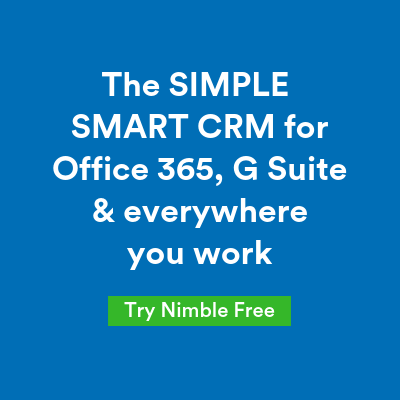 Nimble, a customer relationship management CRM, is built to sync all of your critical Microsoft Office 365 contacts and reminds you when and how to follow up. It was built as the simple, smart CRM for Office 365 that integrates your contact information, Outlook calendar, customer interaction histories, sales cycle data, social networks, and over 130+ SaaS apps (including MailChimp and Quickbooks). With Nimble and Office 365, you’ll no longer have to worry about digging through your Word, Excel, Powerpoint, and inbox and tracking customer contact information to manage your follow-ups. It connects all of your Office 365 communications, contacts, and calendar events to give you the tools you need to build better relationships, stay on top of important follow-ups while managing your sales process cycle and pipelines. “Nimble is a welcome addition to the Office 365 ecosystem, as Nimble clearly has an understanding of the needs of business users in a social, global world,” says Rob Howard, Director and Office Product Marketing at Microsoft Corporation. “Providing contextual information about contacts helps business relationships flourish. Connecting that capability through the new Nimble Smart Contacts app for Outlook is a logical step,” concludes Howard. How Does the Nimble Smart Contacts App for Outlook Work? The Nimble Smart Contacts App for Outlook delivers comprehensive contact profiles in your inbox with information to help grow your relationships in an authentic and meaningful way. Nimble surfaces social profiles from a variety of platforms that uncover your existing customers or potential customer’s job title, company, location, revenue, social media insights, and much more. If you have an existing account or trial, you can also view and update records in Nimble CRM without interrupting your email workflow. 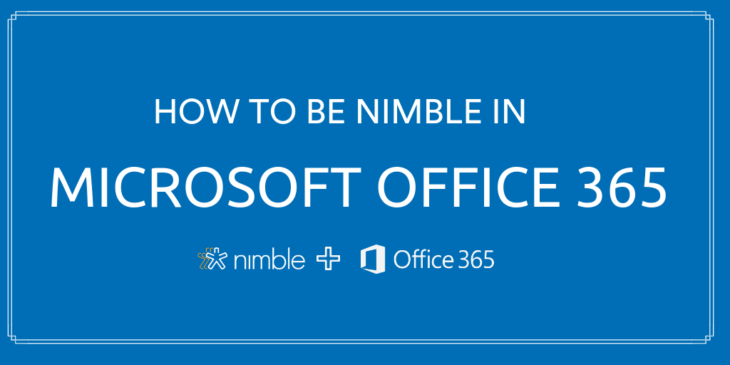 How does Nimble Empower Businesses that Use Office 365? Nimble is the first CRM that automatically unifies your contacts, emails, calendar events, and social media networks into a single platform. With Nimble, you’ll no longer have to dig through different inboxes and address books to piece together important customer information. This cloud-based CRM solution is not just for sales teams — with +130 SaaS application integrations, Nimble CRM benefits the whole company as a team contact manager including sales, marketing, customer service, accounting, and more. 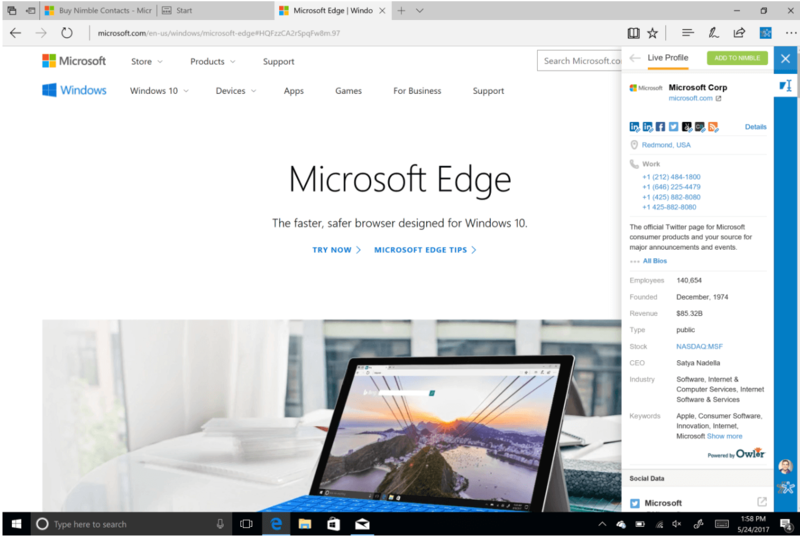 Work with Nimble directly in Office 365 through our browser widget and add-ins for Outlook Desktop, web, and mobile. This means you can easily catch up on your relationship history, send follow-ups, and schedule tasks — all within your existing workflow. In addition to being able to view your follow up opportunities within your inbox, Nimble CRM software enriches your Office 365 contacts with social media information to build a digital dossier of their work experience, location, education, job title, and more to help you send more authentic outreach or marketing campaigns. Add the Nimble Smart Contacts app for Outlook and the Smart Contacts browser extension to access your CRM tool within your Outlook calendar, inbox, Skype, contact profiles, and anywhere else you’re working online. With our Nimble Smart Contacts app for Outlook, you’ll automatically get business insights on contacts you are communicating with — everywhere you work. The app can be used in Outlook on desktop, web, and in your iOS or Android Outlook Mobile apps. Nimble offers a chatbot tab for Microsoft Teams to allow you to easily look up the Nimble record with a simple text query. Great for teams that are discussing key contacts in a chat. Simply chat with the Nimble Contacts bot to locate a record without disrupting your workflow. Say “@Nimble Contacts find Joseph Kelly” and you’ll instantly see their Nimble record with the ability to view their social stream, see relationship history, and then set your follow-ups. Nimble’s CRM system is constantly improving the workflow of your sales team with a focus on fostering genuine human engagement with sales leads and existing customers. Nimble surfaces your contacts’ social media streams and digital footprint to help sales teams and business people build deep relationships built on trust and integrity. It also creates an airtight system in which important opportunities for engagement and prospecting don’t fall through the cracks.